We’d love your help. Let us know what’s wrong with this preview of Jesus of Nazareth by Benedict XVI. To ask other readers questions about Jesus of Nazareth, please sign up. I read this trilogy not in order (doesn't make it confusing), so this is my last one of the three, and I think it's not a bad way to end. Whatever I may think of the author now, it's true that he can write, calmly, clearly and bringing new things up for us to realise. He also brings up other writer's points of view about certain subjects. This book focuses on Jesus' active preaching part of life, from the Baptism to the Transfiguration, with the Passion left for another book, and the childhood ti I read this trilogy not in order (doesn't make it confusing), so this is my last one of the three, and I think it's not a bad way to end. Whatever I may think of the author now, it's true that he can write, calmly, clearly and bringing new things up for us to realise. He also brings up other writer's points of view about certain subjects. This book focuses on Jesus' active preaching part of life, from the Baptism to the Transfiguration, with the Passion left for another book, and the childhood times likewise. At the end is glossary and small bibliography; the main text is in 10 chapters. I made a load of notes on this one, which I guess shows the book's quality :) I talk below of some of the bits in each chapter, not everything but some of what I noticed. I think the first chapter made the most impression on me, partly at least because I could see a film of the Baptism running in my head, at various speeds so that the scene lasted quite long *lol* A point of saying 'yes' to God's path, of first time of Jesus going down to depths, then up again - the Passion's first sign (though of course many things that happened, including this, can be seen the best way afterwards - doesn't make it lesser either). Then the desert temptations, some things that people think and say about and to Jesus already here: demand for food (see miracles of the loaves and last supper) - wrong charity asked; asking proof through "grant us now your protection"; using power to secure faith, Barabbas the resistance leader 'doing it now', Jesus is no bringer of worldly better-world. Earthly kingdoms fade, Jesus "has brought God" to all nations. Third chapter talks about the Kingdom of God. It's not empty talk of an emperor, but a good, saving message. The Kingdom is in person (Jesus) or located in man's inner self (mystic), or with the Church (closeness). OT text moving towards Jesus' existence, then things go beyond. God acting through Jesus. Images of the mustard seed, leaven, field-treasure and pearl of great price. Sermon of the Mount (being like a new Mount Sinai): beautitudes and a new version of Torah. Blessed are not what the world wount want, joy already before the glorious future. The sermon is a map for disciples. Poverty, humility, openness towards God, to be given outwards, compassion for others, knowing persecution is ahead, purity of heart. The woes: what not to do, the path of ruin, Earthly joys and 'independence'. Law of Christ, preaching as one with authority which causes alarm since it goes beyond safety and boundaries of Jewish faith (but doesn't really destroy the law). Lord's prayer, line by line. Not showy, no 'chatter'. Formulaic prayers are needed sometimes. A picture of Jesus' inner attitude for us to imitate. "Our" not "I". To not be stretched beyong our strength, to never lose God and be able to endure in affliction. About the disciples, the 12. Jesus gave them inner knowledge, skills (to heal, exorcise etc.) and preparation talks. God gives of freedom from the demons we saw before in nature and such. There is also a bigger circle of 70/72 disciples, with similar mission, plus the women followers, mentioned by Luke (who in general is quite women-positive in my opinion). The parables, especially Luke's examples: the good Samaritan, the prodigal son, rich man and Lazarus, the heart of Jesus' preaching. They point towards the Cross and are part of it. Non-apostle people can fail to find the angle to get 'inside' these saying, or refuse to leave reality, preferring proofs. The good Samaritan: charity outside one's community, risking it to be charity like Jesus, also image of Adam being rescued by Christ and brough to Church. In prodigal son: the faraway land as earthly 'freedom', father giving back the 'first robe' of innocence and the feast as Eucharist. Older son's reaction as envy of what younger has been able to do, yet should come and share the joy which is better. The Lazarus story: the real good is the future good and present charity; Lazarus as Jesus; rich man asking for sending of proof. Eight: principal images in John's gospel (water, vine and wine, bread and the shepherd). John is more Jerusalem-centric and visual. Shows signs of knowing Jesus' world and Hellenistic Jewishness. Lots of things happen during Jewish festivals. New idea (for me) about the writer: first a lesser disciple of Jesus who let Peter where Jesus was taken from the garden, then a disciple of John the Apostle. The images are talked of thoroughly, but I'm leaving them out of this review. Peter's confession and Transfiguration: having them happen close to each other deepens both and connects them to the Passion. On the way to Jerusalem comes the confession: outsider have used prophet names, past-figures. The scandal about Jesus is his equality with jesus (but to Pilate the accusation is given as political one). Transfiguration happens 6-8 days afterwards and is like Moses' ascent to Sinai. We see Moses (law) and Elijah (prophets). Jesus going all bright-white is a connection to God, and the mountain bit conncets to the 'mountain' of Passion. Last chapter: Jesus declaring his identity, the titles he mentions about himself (the son, son of man, and use of "I Am"). "Son Of Man" is in NT used by Jesus only (quoted by Stephen once), in OT it appears in Daniel's 'four beasts' vision. "Son": kings have used it as being sons of divinity (Egypt, Babylon, Rome); image of Israel as firstborn nation of God with eternal king promised, who actually rules by faith and love. And then the "I Am" - in Exodus from the burning bush (also can be seen later as Jesus' cross) - God just "IS". Jesus saying "I am He", meaning I am YHWH. And many recognise what he means, especially during his interrogation, no wonder the troubles after. Undoubtedly the most profound book I’ve read in 2008 and the best book on Jesus – outside of the Gospels – I’ve ever encountered. Joseph Cardinal Ratzinger, now Pope Benedict XVI claims, “this book is . . . my personal search ‘for the face of the Lord.’” It can be yours too. It is alternately poetical, mystical, scholarly, exegetical and meditative. It is always erudite, challenging, thoughtful and catholic, i.e., universal. It is never preachy or pedantic. Jesus of Nazareth is not for the faint- Undoubtedly the most profound book I’ve read in 2008 and the best book on Jesus – outside of the Gospels – I’ve ever encountered. Joseph Cardinal Ratzinger, now Pope Benedict XVI claims, “this book is . . . my personal search ‘for the face of the Lord.’” It can be yours too. It is alternately poetical, mystical, scholarly, exegetical and meditative. It is always erudite, challenging, thoughtful and catholic, i.e., universal. It is never preachy or pedantic. Jesus of Nazareth is not for the faint-hearted, nor casual reader. I read every chapter except the last a minimum of three times, often more and mostly because it was necessary. On my first read throughs I found it impossible to take in the depth of his theology while keeping up with him. Paragraphs are packed with references. In order to do this book justice, you need to sit with a good bible translation beside you at all times. I only wish I’d had access to more of the books and authors the Pope quoted. He drew heavily from Holy Scripture, Scripture scholars (from different denominations), Church Fathers—east and west, saints and their writings and biographies, historical figures, philosophers, atheists, and numerous modern exegetes. In fact, it was the depth and breadth of the Holy Father’s sources which first surprised, then amazed and finally thrilled me; here was a true Shepherd for all of humanity. Any one human being who could command such a vast storehouse of the world’s knowledge is nothing short of a genius. And yet, it wasn’t his brilliance in the end that mattered, but his humility and simplicity. The book’s dust jacket claims that PBXVI is seeking to salvage the person of Jesus from recent “popular” depictions and restore Jesus’ true identity as discovered in the Gospels.’ As if Our Lord needs “salvaging” or “restoration”! If in fact that was his intention when he began the book, he surpassed that simple objective and left it far behind in what he ultimately created. However, since PBXVI does address recent ‘scholarship’ which seeks to quantify every aspect of faith, even this issue is dealt with in a straightforward and factual manner. Each chapter in JoN is a scholarly, yet spiritual, treatment of one aspect of Jesus and/or His ministry. The book is ten chapters, begins with Our Lord’s Baptism and covers a number of significant events/issues relevant to the God-man Jesus Christ, concluding with the revelation of His identity. Tantalizingly – if you glean as much from the book as I did – the Holy Father promises a sequel, or rather, the second half of this book. An important thing this book did for me was remind me how much there still is to learn about Jesus of Nazareth, and I don’t just mean facts, although there were plenty of those, but in terms of one’s personal relationship with Him—and how much spiritual ‘growing up’ I still have to do, or do I mean ‘growing down’? PBXVI gave me new perspectives on parables I thought I knew inside out. He connected symbols and figures from the Old and New Testaments – many of which I’d seen and heard before – but in ways stunningly innovative. He introduced me to numerous authors and scripture scholars completely unknown to me before. In the middle of a piece of text, there would be a sentence which would reach out and literally grab my attention like a hand jumping out at me from the page. My faith life has been re-energized by this book in ways I could never have dreamed possible. But mostly, I have come to see Him, Jesus, through the eyes of his servant, Joseph Cardinal Ratzinger, Pope Benedict XVI. I am in awe. On Chapter 8 now. Not sure but I think that may end up being my favorite chapter. Up until two days ago, it was Chapter 2, The Temptations of Jesus. Then I stayed up until 3 in the morning reading Chapter 7, The Message of the Parables. Absolutely AWESOME! It only covers three Parables, sadly but then it is only a chapter. PBXVI would need a whole book to do justice to all the parables. (Pray he writes one!) Prior to reading Chapter 7, I thought Henri Nowen's book, "The Parable of the Prodigal Son" the very last word on that parable, but I should have known that when it comes to Our Lord's parables there will never be a "last word"! Thanks be to God! Anyway...the Holy Father has plenty more to say on three more parables and it makes fascinating reading, not too mention great material for reflection! However, as John's Gospel is my personal favorite, Chapter 8 is looking like it may complete with a good night's sleep very soon! Can't believe I hadn't updated my entry to reflect that I'm currently reading this! It is excellent by the way. Why have I waited so long to read his writing? I stumbled across Joseph Ratzinger’s first volume of Jesus of Nazareth in a local public library a couple of years ago, and thumbed through it, at first, in idle curiosity. Hmm, I wonder what the Pope has to say about Jesus? What struck me immediately was the book’s tone. This didn’t read like some ponderous declaration of ancient dogma from the Papal Throne. It was like reading something my late father-in-law might have written, gen I stumbled across Joseph Ratzinger’s first volume of Jesus of Nazareth in a local public library a couple of years ago, and thumbed through it, at first, in idle curiosity. Hmm, I wonder what the Pope has to say about Jesus? I put it back on the shelf, making a mental note to return soon, check it out, and read the whole thing, a mental note I promptly misplaced. As I was stocking my new Nook with books I’ve been meaning to read, this one came to mind again, and I’m glad it did. Scholars on both sides of the Protestant/Catholic divide acknowledge that Joseph Ratzinger is one of the most gifted theologians of his generation. It might make a book such as this seem a bit intimidating on its face, something that promises pages and pages of arid exegesis of obscure Scripture passages. It’s nothing of the sort. He begins in his foreword with a critique of the historical-critical method of Biblical scholarship—a method he finds useful but limited because its search for the “historical Jesus” can yield a picture only as complete and precise as the historical knowledge and assumptions that form its lens. It has context, but lacks content. Instead, Ratzinger proposes we start from a simple statement of faith: Jesus Christ is as the Gospels present him—fully man and fully God, communicating his divinity “veiled in parables, yet with increasing clarity.” Starting from this benchmark reveals, he says, “a way and a figure that are worthy of belief,” a person whose undeniable impact on the world makes perfect sense, rather than posing the conundrum of an obscure Jewish carpenter possessed of extraordinary influence, far beyond anything the collection of historical facts about his life could predict. Ratzinger’s journey through the early ministry of Jesus begins in the Book of Deuteronomy, at first glance an odd place to start, but he ties the advent of Jesus together with God’s promise to Israel of another prophet like Moses, “whom the Lord knew face to face.” Moses had led his people into the Promised Land, but not into complete liberation or salvation. They were still in need of “an even more radical kind of exodus,” one that required a new Moses, someone who possessed an intimacy with God that exceeded Moses. "We have found three terms in which Jesus at once conceals and reveals the mystery of his person…All three of these terms demonstrate how deeply rooted he is in the Word of God, Israel’s Bible, the Old Testament. And yet all these terms receive their full meaning only in him; it is as if they had been waiting for him." This is a book best read slowly and with care, perhaps a chapter at a time, with ample time for reflection between readings. If you’re unacquainted with Jesus, if you want to understand him a little better, or even if you think you know everything about Jesus you need to know, this book’s for you. Give it a read. This book is a facinating deeply personal insight into the mind of this Pope. The Pope writes with both fitting erudition and the deep earnest conviction one would hope to find in an office so many people look to for spiritual leadership. The book is however quite dry and is of no use to anyone but an already committed believer. His exploration of the personhood of Jesus and his mission is very well grounded, but so deeply grounded that it bores with its repetition and constant preemptive strike This book is a facinating deeply personal insight into the mind of this Pope. The Pope writes with both fitting erudition and the deep earnest conviction one would hope to find in an office so many people look to for spiritual leadership. The book is however quite dry and is of no use to anyone but an already committed believer. His exploration of the personhood of Jesus and his mission is very well grounded, but so deeply grounded that it bores with its repetition and constant preemptive strikes against possible lines of argument against it. His fundamental thesis, that the Kingdom which Jesus was ushering into being was He himself, is not something I think will surprise any believer even if he never thought to articulate anything so basic. I did however particularly like this Pope's discussion of the Sermon on the Mount. "Jesus of Nazareth" is not a life of Jesus in the style of Romano Guardini’s "The Lord", Frank Sheed’s "To know Christ Jesus", or Archbishop Sheen’s "Life of Christ." The Pope does not set to piece together the Gospels and present the story of Christ in specific chronological order. After the foreword and introduction the first of ten chapters deals with the Baptism of the Lord and ends with the Transfiguration and discussion of Son of Man, Son of God and Jesus’ I Am statements. After reading the introduction and getting to the last chapter I was surprised to find that it is obvious that the Holy Father will be continuing the subject in a subsequent book. He mentions a part two in the introduction and I had originally thought that this was a delineation in his current book. The main part of the book runs 358 pages and over the four days I read it I stayed up late into the night because I did not want to stop reading it. The foreword and introduction covers information such as his approach in writing this book and how problematic many previous works attempting to get at the "real Jesus" have been in the past. Throughout the book he comments on approaches like what the Jesus Seminar took and there is even one rather humorous short quip towards the end of the book on this that made me laugh when I read it. In the foreword he says "they are much more like photographs of the authors and the ideals they hold." No doubt you will not be surprised to learn that the Pope believes the "Jesus of History" and the "Jesus of the Gospels" are not two separate things. "…The main implication of this form my portrayal of Jesus is that I trust the Gospel. Of modern exegesis tells us about literary genres, about authorial intention, and about the fact that the Gospels were written in the context, and speak within the living milieu, of communities. I have tried, to the best of my ability, to incorporate all of this, and yet I wanted to portray the Jesus of the Gospels as the real, "historical" in the strict sense of the word. …"
My own humble opinion is that is has achieved this in spades. At another point he writes "This book is my personal search ‘for the face of the Lord.’" and he certainly has illuminated the face of Jesus in his writing. One of the common themes in this book and really in his whole life is "listening" to the scriptures. Those who know him have reported that he is a good listener in that he allows others to make a case. His listening of scripture is not just to a specific verse, but all of scripture and throughout the book he shows this capability in showing specific scriptures as being in harmony with the whole. He has criticism of some theories that fail to pass this test where exegetes try to pass off a theory that just doesn’t fit the whole of scripture. At the Transfiguration God the Father instructed the three Apostles, and really all of us, to listen to his Beloved Son. Pope Benedict takes this seriously as he fleshes out Jesus of Nazareth. This book is packed with information and his insights into scripture. He is also quite willing to use modern biblical scholarship and tools such as the historical-critical method when it is properly guided and not used as an end to themselves to justify a exegetes original pretext. He is also quite willing to take the insights of some he identifies as liberal scholars and he take the good of what they have to offer and in many cases to tease the truth of their idea and to more fully develop it. In the chapter on the Sermon of the Mount he talks about the book A Rabbi Talks with Jesus by Jewish scholar Jacob Neusner which he says he was greatly helped by and he also tries to answer some of the questions raised. Over and over again it is quite evident he is quite aware of the modern currents of biblical studies and accepts some hypothesis where he thinks they are plausible and also to critique those ideas which are false. The chapter on the Our Father prayer is worth the price of the book alone. This is not just an academic exegesis of the Our Father prayer line-by-line, but a deep meditation into this prayer. Often we can repeat a prayer so often that it looses its freshness and his meditation on this prayer can shock us back into reality of what the prayer that Jesus gave us really means and indicates. The chapter on the message of the parables starts out by working through the definition of a parable and what it is and then he focuses on meditations on three specific parables. Also fascinating is the chapter on the principle messages of John’s Gospel. Up to this point he had been mostly working with the texts of the synoptic Gospels and he principally explores the use of water in John’s Gospel and then then explores other elements. What is wonderful about the Pope Benedict’s book is the way he combines scripture scholarship, meditation, and insights. Often he laments the problems of poor translation of the original texts and then explores the actual meaning giving a greater depth to verses that you might normally pass by. The book is soaked with scripture references as you would expect and I often resorted to my Logos Bible Software to be able to note these references and his translation of some of the words. You may hear about Jesus every Sunday and think you already know all there is to know about Him. But when you love someone, you can never spend too much time getting to know him better. Benedict discusses familiar Gospel stories in a new light, and makes them relevant to modern theological discussions that are going on both within Christianity and with other world religions. It is deep material, so it takes a while to read, but it is worth it. I read this book during Lent this year. Though it has many scholarly components to it, this book felt, to me, like curling up with my professor grandfather. Pope Benedict uses imagery that’s accessible and even, in places, unexpected. I’ll be digesting and referring back to this book for quite some time to come. Julie and Scott take a quick swim to the deep end of the pool (where all the cool kids hang out) to talk theology: our discussion is Good Story #59. When I received Pope Benedict XVI's Jesus of Nazareth I had previously written that in reviewing such a book "I am not worthy." Exactly how do you go about reviewing a book by a scripture scholar and theologian of the magnitude of the Holy Father? Well the task is easier than I thought it would be. For one this isn't a book addressed to a limited audience of scripture scholars and exegetes, but one that everybody can benefit from. I have read several of his books and I found this one the easiest When I received Pope Benedict XVI's Jesus of Nazareth I had previously written that in reviewing such a book "I am not worthy." Exactly how do you go about reviewing a book by a scripture scholar and theologian of the magnitude of the Holy Father? Well the task is easier than I thought it would be. For one this isn't a book addressed to a limited audience of scripture scholars and exegetes, but one that everybody can benefit from. I have read several of his books and I found this one the easiest to read. I am tempted to say something as cliche as "If you only read one book this year ..." if I didn't find this phrase personally quite scary and I suspect the Holy Father would have the same view on this. "Jesus of Nazareth" is not a life of Jesus in the style of Romano Guardini's "The Lord", Frank Sheed's "To know Christ Jesus", or Archbishop Sheen's "Life of Christ." The Pope does not set to piece together the Gospels and present the story of Christ in specific chronological order. After the foreword and introduction the first of ten chapters deals with the Baptism of the Lord and ends with the Transfiguration and discussion of Son of Man, Son of God and Jesus' I Am statements. After reading the introduction and getting to the last chapter I was surprised to find that it is obvious that the Holy Father will be continuing the subject in a subsequent book. He mentions a part two in the introduction and I had originally thought that this was a delineation in his current book. "...The main implication of this form my portrayal of Jesus is that I trust the Gospel. Of modern exegesis tells us about literary genres, about authorial intention, and about the fact that the Gospels were written in the context, and speak within the living milieu, of communities. I have tried, to the best of my ability, to incorporate all of this, and yet I wanted to portray the Jesus of the Gospels as the real, "historical" in the strict sense of the word. ..."
My own humble opinion is that is has achieved this in spades. At another point he writes "This book is my personal search 'for the face of the Lord.'" and he certainly has illuminated the face of Jesus in his writing. One of the common themes in this book and really in his whole life is "listening" to the scriptures. Those who know him have reported that he is a good listener in that he allows others to make a case. His listening of scripture is not just to a specific verse, but all of scripture and throughout the book he shows this capability in showing specific scriptures as being in harmony with the whole. He has criticism of some theories that fail to pass this test where exegetes try to pass off a theory that just doesn't fit the whole of scripture. At the Transfiguration God the Father instructed the three Apostles, and really all of us, to listen to his Beloved Son. Pope Benedict takes this seriously as he fleshes out Jesus of Nazareth. The chapter on the Our Father prayer is worth the price of the book alone. This is not just an academic exegesis of the Our Father prayer line-by-line, but a deep meditation into this prayer. Often we can repeat a prayer so often that it looses its freshness and his meditation on this prayer can shock us back into reality of what the prayer that Jesus gave us really means and indicates. The chapter on the message of the parables starts out by working through the definition of a parable and what it is and then he focuses on meditations on three specific parables. Also fascinating is the chapter on the principle messages of John's Gospel. Up to this point he had been mostly working with the texts of the synoptic Gospels and he principally explores the use of water in John's Gospel and then then explores other elements. What is wonderful about the Pope Benedict's book is the way he combines scripture scholarship, meditation, and insights. Often he laments the problems of poor translation of the original texts and then explores the actual meaning giving a greater depth to verses that you might normally pass by. The book is soaked with scripture references as you would expect and I often resorted to my Logos Bible Software to be able to note these references and his translation of some of the words. This is my second reading of this book. Pope Benedict writes very clearly and explains the context of the words of Jesus from the Old Testament. I particularly liked the chapters on his Baptism, the Sermon of the Mountain (and the explanation of how a Jewish rabbi understands the words of Jesus), the Transfiguration, and the titles of Jesus. This is probably a 4 or 5 star book, but I have a 3 star brain. The Pope is a much smarter man than I. Have a pen and highlighter with you when you read this book - the professor is in and class has started! Thoroughly readable, but also deep. Highly recommended reading for the time between Epiphany and the Easter Triduum (that begins with Holy Thursday). At times, it reads like a textbook (so have a dictionary nearby), but it's because he is doing a critical study of all the other studies about Christ - before he presents his personal understanding of his King. All throughout, though, there are so Have a pen and highlighter with you when you read this book - the professor is in and class has started! All throughout, though, there are so many awesome nuggets of new understanding about Jesus and Scripture. - The mission of John the Baptist (and all Jewish prophets), not as mere magicians who predict the future. - Barabbas as "bar-abbas" - the false "son of the father"
... all amazing insights in just the first two chapters! - discussion about the importance of the Sabbath as a renewal and reinforcement of the family (and, thereby, society) and Jesus as Lord of the Sabbath. This book ends with The Transfiguration, but foreshadows it about a third of the way through with the line: "...the dialogue between The Law and The Prophets..." This explains who Jesus is in figurative terms, but also foretells the literal discussion between Jesus, Moses (the Law) and Elijah (the Prophets). - We learn prayers (from Jesus, the Church, and the Saints) because we do not know how to pray - we are babbling like babies, but Mother Church teaches us how we are to pray. - Also, the Our Father, recited backwards, traces the journey of Jesus and the Israelites (from temptation, through the desert, relying on God for bread, to the coming of the Kingdom to Heaven and Our Father). He also gives a line-by-line breakdown of the Our Father that is very enlightening. Este es uno de los mejores libros, sino es que el mejor, que he leído en mi vida. También, este es el libro que más me he tardado en leer (tres meses y medio, según el historial de Amazon), bien por su complejidad y por el impacto que generó en mí al leerlo. En ciertos momentos tuve que releer algunas partes y razonar por días su contenido. A veces tuve que hacer consultas que un católico entregado o algún apasionado de la teología podría prescindir. Fue un reto intelectual, y al principio fue u Este es uno de los mejores libros, sino es que el mejor, que he leído en mi vida. Fue un reto intelectual, y al principio fue una conmoción el leer algo escrito por un creyente mucho más inteligente que yo, algo que por mi arrogancia de ateo me resultaba imposible aceptar. Ahora estoy convencido de que ponerte al servicio de la fé no es sinónimo de ignorancia. This book surprised me. It touches on biblical commentary with thoughts I have never heard before. I have been impressed with Ratsinger's writings but this one is really good. It explains things that I have never heard explained before and in a very easy to understand style. This is truly a good read and not just a text book approach. If I could give this book 10 stars I would. Even though it took me almost a month to read, this is one of the best books I've ever read. This book was written by a man who is clearly a disciple of Jesus and has spent his life traveling along side the Lord. It is at once academic enough that it should be included in any course on Christology and at the same time spiritual enough that you should read it in front of the Monstrance during Eucharistic adoration. Jesus is depicted as a figure deeply r If I could give this book 10 stars I would. Even though it took me almost a month to read, this is one of the best books I've ever read. This book was written by a man who is clearly a disciple of Jesus and has spent his life traveling along side the Lord. Jesus is depicted as a figure deeply rooted in the Old Testament. He is the God of the Old Testament and for Christians to truly know him they need to be steeped in scripture. Pope Benedict shows in so many ways that the man Jesus really is the same God who espoused Israel and planned for her salvation from the beginning. Additionally, this book is THE answer to a century of biblical scholarship which leaves us not knowing who Jesus is. Scholarship that tries to separate the Jesus of the Bible from the true historical man. Pope Benedict shows how these efforts have done more to reveal who the scholars are than who Jesus is. Benedict reveals that the man of the Bible truly is the real Jesus and he is the one who gives life and gives it in abundance! This is a really deep book and takes a while to get through, but it is worth the effort. My knowledge of Jesus was deepened, especially as Benedict wove together themes from the Gospels and the Old Testament. The uniqueness of Jesus and what he brings (more specifically who he brings--God)is brilliantly expounded. I have read the Pope before in a much shorter work, "Christianity and the Crisis of Cultures" and knew he is a good writer. A lot of Protestants wouldn't consider reading a book from t This is a really deep book and takes a while to get through, but it is worth the effort. My knowledge of Jesus was deepened, especially as Benedict wove together themes from the Gospels and the Old Testament. The uniqueness of Jesus and what he brings (more specifically who he brings--God)is brilliantly expounded. I have read the Pope before in a much shorter work, "Christianity and the Crisis of Cultures" and knew he is a good writer. A lot of Protestants wouldn't consider reading a book from the Pope. This is a mistake. This is no thinly veiled Catholic prep rally. It is a book directed at all who want to delve deeper into their admiration of Jesus. Joseph Ratzinger knows what he's talking about! They didn't make him Pope for nothing! This book reads like a collection of sermons and expositions about what Jesus is all about. Lots of insights about the Kingdom of God, Jesus' fulfillment of the law and Old Testament prophecies, the meaning of the Beatitudes, Parables, and Jesus' symbolic actions. Such a rich book. I'd heard a lot of negative press about Ratzinger as Pope. He's a top-class theologian and a great leader of the Church. Christians Joseph Ratzinger knows what he's talking about! I'd heard a lot of negative press about Ratzinger as Pope. He's a top-class theologian and a great leader of the Church. Christians of all backgrounds would benefit from hearing him out. This book gives a convincing answer to the question, "What did Jesus bring to the world?" His answer is that Jesus brought God. The book is mostly exegesis of the different gospel writers' similarities and differences and how they form a complete picture of God's promises being fulfilled in the person of Jesus. I'd be lying if I said that this book didn't bring me closer to the Christian faith, but at the end it got pretty boring. The first book of the trilogy written by Pope Emeritus Benedict XVI made a speculative study on the life of Jesus Christ. This book is an answer to the skepticism of the recent scholars who deviated from the real person of Jesus. In the recent decades the scholarship of the study of Jesus Christ had gone away from the real meaning of Jesus. All those books came after 1950s had separated the historical Jesus from the Christ of faith. At this juncture the book Jesus of Nazareth by Benedict XVI bec The first book of the trilogy written by Pope Emeritus Benedict XVI made a speculative study on the life of Jesus Christ. This book is an answer to the skepticism of the recent scholars who deviated from the real person of Jesus. In the recent decades the scholarship of the study of Jesus Christ had gone away from the real meaning of Jesus. All those books came after 1950s had separated the historical Jesus from the Christ of faith. At this juncture the book Jesus of Nazareth by Benedict XVI became more relevant. He made a deep study on the Jesus and put forward in ten chapters. This is the first book of the series where he dealt with the Baptism of Jesus to the Transfiguration and Profession of Faith by Peter. The importance Benedict XVI has given to the public life of Jesus is visible in the separations of the books. The infancy narratives and the passion narratives had published later. Pope Emeritus declared in this book that this is a result of his private studies as a defender of faith. This book is not part of the magisterial teaching. Jesus Baptism in the river Jordan and temptation in the wilderness had a significant role in the life of Jesus. The Baptism resembles the new Exodus. By going down to the water of Jordan and enter into the Promised Land. This had also another meaning of crucifixion and death of Jesus. In the Baptism event when Jesus tells to John the Baptist, “let this be done to fulfill all the righteousness,” He is saying yes to the God’s will. He is becoming the suffering servant of Yahweh, the Lamb of God who takes away the sins of the world. The temptation event continues from the baptism Jesus proved as the messiah, the anointed one. He overcomes the every temptation to prove He is really the son of God and He came to the world to show the face of God. Through the conquering of these temptations Jesus reveals the importance of the Ten Commandments and need to keep it for the unconditional love towards God and human beings. The proclamation of the Kingdom of God by Jesus has significance in the light of the message He communicated that of conversion and faith. He critically analyzed the recent scholars who made the study on the kingdom of God. Rudolf Bulttman takes away the Historical Jesus from the New Testament studies. Alfred Noisy who said “Jesus preached the kingdom of God and what came was the church.” The answer given by Benedict XVI was based on the early church fathers. He mainly taken two teaching given by Origien, primarily he said, Jesus himself is the kingdom, then the Kingdom of God is in the heart of the Holy persons, through their acts kingdom of God will be fruitful. The third view is that Kingdom of God is in the Church. He speaks against the liberal theology which Harnack introduced where he reduced kingdom of God into mere individualistic and the eschatological presentation by Albert Schwetzer and several others. The secular interpretation of the Kingdom of God made havoc in this area. They interpreted it in two different ways, in pre – Vatican era it was an Ecclesio–centric and post Vatican it became Christo-centric, then it turned into Theo-centric and at present it reached as Reguo-centric. Reguo-centrism presented Kingdom as coming together of all humanity in spite of religious disparity; the God has no role in this aspect of Kingdom. The real meaning of Kingdom of God presented by Jesus is that God became the centre of humanity. Taking out the kingdom of God from the teachings of Jesus will produce a wrong effect. The kingdom theme is further developed in the Sermon on the Mount. Jesus becomes the new Moses who gave the Torah to Israel and the disciple of Jesus became the representative of 12 tribes of Israel. The prayer which Jesus taught his disciples gave a sure foundation to the prayers of every faithful. The seven petitions in this prayer are theologically rich and spiritually enriching. The kingdom teaching continues in this prayer also. The prime importance to the God’s kingdom is reflected in the first petitions. Asking God for food has a special significance when we look in the context of the Eucharist. The other petitions give relevance in the life of Jesus when he forgave the sins of his murderers and conquered the temptation. The last petition reduces the power of evil in the world and strengthens the life of believers. The exposition on the parables offers a profound meaning to the parables of Jesus. The Good Samaritan shows how to be charitable outside the community. The parable of the prodigal son gives a call to come back from the faraway places where the son went in search of earthly freedom. Father gave back to the son the first robe of innocence and celebrating the feast of Eucharist. The reaction from the elder son can be seen as envious. The Lazarus story gives the meaning that the real good is future good and present charity. The imageries in the Johannine gospels are water, vine, wine, bread and shepherd gives more meaning when these imageries are relating to the Old Testament. Jesus becomes these images and changing the old images. Jesus becomes the life giving water, the vine and the disciple becomes the branches, he gives the real wine which is his blood, the manna has been replaced by the bread of heaven which is his body and the shepherd which we see in the Ezekiel had been transformed by Jesus who became the good shepherd. The last two chapters the identity of Jesus and the transfiguration connect Jesus with the Moses. The transfiguration shows us Jesus dialogue between the law and the prophets. Jesus identification proceeds from this event prove that Peter’s confession which comes from the Father in heaven. The book presents a typological way where Jesus represents all the Old Testament types and proved he is more than that. The last chapter about the identity of Jesus completes through the seven figurative expression of I AM sayings, I AM the bread of life, I AM the light of the world, I AM the door, I AM the good shepherd, I AM the resurrection and the life, I AM the way, the truth and the life and I AM the true vine. To know more about Jesus we need a child like faith who listens to him always. The book invites all the believers to nurture such kind of faith in Jesus. I'm working on creating a maxim that goes something like this: the more hyperbole on the back cover, the less likely any of it is to be true. A simpler way of expressing this same sentiment is: Laud? Have mercy! Let me share with you the blurb appearing on the back cover so you can better understand where I'm coming from when I finally get to the review of the book. "In this bold, momentous work, the Pope seeks to salvage the person of Jesus from recent "popular" depictions and to restore Jesus' I'm working on creating a maxim that goes something like this: the more hyperbole on the back cover, the less likely any of it is to be true. A simpler way of expressing this same sentiment is: Laud? Have mercy! Let me share with you the blurb appearing on the back cover so you can better understand where I'm coming from when I finally get to the review of the book. "In this bold, momentous work, the Pope seeks to salvage the person of Jesus from recent "popular" depictions and to restore Jesus' true identity as discovered in the Gospels. Through his brilliance as a theologian and his personal conviction as a believer, the Pope shares a rich, compelling, flesh-and-blood portrait of Jesus and invites us to encounter, face-to-face, the central figure of the Christian faith." I find it nearly impossible not to at least glance at the back cover blurb, but this practice has ruined books for me when I discover that the contents don't live up to the hype of the ecstatic copywriter waxing eloquently, fawning over the book. I bet those copywriters never even read the books, or if they do, have a hard time writing copy without smirking. Before I get to the review, I'd like to make another comment to which I will circle around later and tie in with my review: it must be a difficult task to edit a book written by the Pope. How does one go about offering suggestions of corrections to "his holiness"? I appreciate the delicacy an editor must take when offering advice on anything written by a Pope. After reading the blurb and having my interest piqued, I dove into this book with high expectations. My expectations, as the 3-star rating will attest, were soon dashed. It's not that this book is bad - not by a long shot. It's a pretty good book and quite interesting in places. But, bold and momentous it is not. How does the Pope make a book on Jesus bold? By denouncing Him as Messiah? That would be bold. Sticking to a middle-of-the-road view of Jesus is not bold when you are the Pope. Everyone expects the Pope to defend Jesus, just as a Muslim denying the supremacy of Christ is not bold in their utterance. And for momentous? I would expect vast quantities of new insights into the person and work of Jesus. Sure there were new insights, or at least insights I was unfamiliar with, and I appreciated reading those, but momentous? Not even close. Essentially, this book is a rambling commentary by Mr. Ratzinger, bringing together years of study and personal reflection on the Gospels, written in a very gentle manner. I appreciated greatly the mild mannered, polite, humble approach Mr. Ratzinger brought into the book, but the bottom line is this: if Mr. Ratzinger never had climbed to the heights of the papal throne this book never would have seen publishing ink. I'm not Catholic but it does take a little nerve to critique a book by the Pope. Here goes, however. Some of this book I really liked. It is part of a planned multi-volume work on the life of Jesus. Benedict takes several episodes from Christ's life (the Sermon on the Mount, the Transfiguration, several parables, etc.) and uses those to discuss the nature of Jesus and his mission. There are no particularly novel interpretations here. He focuses on Christ as both fully God and fully man. This is, I'm not Catholic but it does take a little nerve to critique a book by the Pope. Here goes, however. Some of this book I really liked. It is part of a planned multi-volume work on the life of Jesus. Benedict takes several episodes from Christ's life (the Sermon on the Mount, the Transfiguration, several parables, etc.) and uses those to discuss the nature of Jesus and his mission. There are no particularly novel interpretations here. He focuses on Christ as both fully God and fully man. This is, of course pretty standard Orthodox belief but it is a change in focus from a lot of modern commentators who tend to emphasize Jesus the human being and great moral teacher while downplaying his divine nature. I liked this emphasis and found some of his insights (the discussion of the terms Son of Man and Kingdom of God, for example) to be very profound. On the other hand, you can tell that Benedict came from academia. There is much discussion and refutation of exegesis by scholars that most general readers have never heard about. I find it hard to believe that anybody outside of seminary students or theology professors will be interested in this. And the writing can be pretty dense at times. Since I assume that the Pope wrote this in his native German it is possible that this is the fault of the translator but it reminds me of some professors I had that were very very smart but not always the most dynamic communicators. 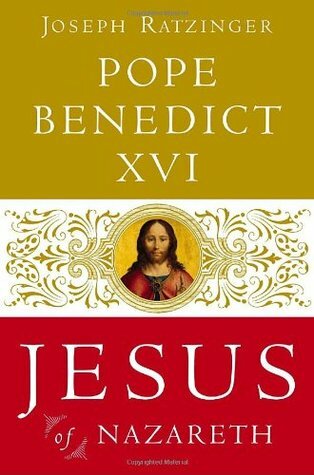 Short Review: This is the first of a trilogy of book on Jesus that Benedict XVI published after he became pope. This is a theological (not historical) exploration of Jesus. It is a highly readable book; surprisingly so considering it is a translation from German and from a renown scholar. It is clear from the book that Benedict is a real scholar. But he is not writing a scholarly book, but a theological book. There is not a lot that is really new here. But there are some sections of brilliance. Short Review: This is the first of a trilogy of book on Jesus that Benedict XVI published after he became pope. This is a theological (not historical) exploration of Jesus. It is a highly readable book; surprisingly so considering it is a translation from German and from a renown scholar. It is clear from the book that Benedict is a real scholar. But he is not writing a scholarly book, but a theological book. There is not a lot that is really new here. But there are some sections of brilliance. And it is a solid book on Jesus. Worth reading if you have not read anything by Benedict before. What a fantastic book! I cannot wait to read the next volume. Ratzinger's examination of Jesus is mindblowing. A must-read for any Catholic or Orthodox, and even any non-Catholic Christian. I got it for Christmas a few years ago. I started it then but gave up pretty quickly. I think I needed the philosophy I gained in the intervening years to fully appreciate what the Holy Father was saying. It isn't the densest of his works, but it is not for the faint of heart, either. Actually this one I have on audiobook. It is so dense that I find this is the best way to work through it. My inintal reaction to this book, before revisiting the pages I have highlighted is that I feel that I have been listening to lectures connecting strands and understandings of God in the Old Testament to Jesus in the New. I truly appreciate this work and anticipate using it as a reference in preparing my own lectures going forward - the themes are clearly identified and supported, terms are well-defined, and historical "sitz im leben" is clearly presented. Ratzinger has done well in sharing the Jesus he knows so well. This book picks up where the first (or last) left off. Important to remember is the theory that the New Testament (and all the stories and understandings of Jesus progressed backwards) with his death and resurrection being the most vital and first segments of his life to be analyzed and understood, then the period that is recounted in this book, from his baptisim to his transfiguaration. And then finally Jesus' early life; his origins and nativity. So I am reading them in chronological order of Jesus' life, not the order they were developed, nor the order in which Ratzinger wrote them. What is left for me is the final episodes of Jesus' life. I also appreciate the special attention given to the Gospel of John, as it will lend itself well to support the development of my upcoming lecture preparations on that Gospel, John's letters, and Revelation. In some ways I think our search for Jesus will and should never rest, but our relationship with him needs to move from searching to development, to deeper development, etc. Ratzinger speaks of his trust in the Gospels, which I so appreciate. I have often spoken to people who question or want to discount the Bible's authenticity, yet they hold up other discoveries in antiquity, writings and more as fact. How is it that the most prolific book in history, with multiple versions found in multitudes of locations with millions of disciples, followers and believers can be thought to be 'untrue'. I trust the Gospels too, in them lies the way and the truth and the life; the way I want to find, the truth I want to understand and the life I want to live. He writes on: "Isn't it more logical, even historically speaking, to assume that the greatness came at the beginning, and that the figure of Jesus really did explode all existing categories and could only be understood in the light of the mystery of God?" (xxiii) This quote speaks to me of one of my professors' incredible teaching momets, a paradigm shift for me when she drew and ever-expanding upward spiral in an attempt to grasp the concept of increasing faith - that moment and that image pervades my understanding of faith and scripture now - almost daily. Beginning with initial reflections on Jesus as the New Moses to the understanding of the historical-societal structures of Jesus' time, the picture painted for the reader is one that will open up the power of who Jesus is more deeply than just a straight reading of the Gospels could ever do. Jesus' baptism is addressed in a manner that lets us understand why he, a man without sin, was right to go to a distant place to be baptized by water, the powerful symbols of water are discussed and the vision of heaven torn open is opened up to us in a new way. I would more completely understand this episode in Jesus' life as the outbreaking of the Kingdom of God with Ratzinger's explanations in chapter two. That outbreaking - or revelation - brings requirements for us all. "Jesus has brought God and with God the truth about our origin and destiny: faith, hope and love. It is only because of our hardness of heart that we think this is too little." (44) Reflect, chew and swallow that one. When we grasp it all we can say is 'wow' and the feel the guilt set in, which can only be addressed by our own taking action in those three great truths. Too little? If we feel this call is too little, then we do not really understand the definitions of these words. The Temptations are covered in chapter two, but I made so many notes I cannot even begin to 'review' it here, except to say that Ratzinger brings the Temptations into focus in a way that applies them to ourselves and to warn us of the dangers we face even today. Satan is a devilish fellow for sure. Chapter three, focused on the Kingdom carries us through to an even deeper understanding... we realize what is demanded of us, faith and (I think) constant conversion. "The one who is praying helps to bear [the world] on his shoulders, and through his prayer, God's lordship shapes his way of life, his day-to-day existence, making it a locus of God's presence in the world." (57) In this way we all grow and reveal God's kingdom, but we can also limit it, shrink it and worse. This transcends time and place - it is happening right now. "Only by accepting it in its entirety can we gain access to, and let ourselves e guided by his message." (59) [Man] will always need the gift of goodness and forgiveness, but in receiving it he will always learn to pass the gift on to others. The grace for which he prays does not dispense him from this. It is what makes him truly capable of doing good in the first place. He needs God, and becasue he recognizies that, he begins through God's goodness to become good himself." (62) "He", "man", "humanity", "we", with faith and conversion all expand and grow the Kingdom of God. For anyone first discovering the Sermon on the Mount, Ratzinger will only whet your appetite to delve deeper. The Beatitudes, expanding our comprehension of the Ten Commandments; the Antitheses, building our understanding of how to live our lives and the importance of The Lord's Prayer, being the guidepost through it all shines through beautifully. He calls it a 'transformation of values' and that is wonderfully true. There is a power in each word of the prayer that Pope Benedict unfolds for us. Even just the "our" breaks down division - think about it for a while. "Our" Father... it is a demanding thought, isn't it, especially in our contemporary world of individuals 'possessing' things, wealth, power, et cetera? There are only a few parables reviewed by Pope Benedict, clearly a Biblical Scholar at hear: The Good Samaritan takes on renewed meaning when we are reminded that we are to be the Samaritan, everyone is called to be, who was really a foreigner/stranger in the land; and The Prodigal Son which is drawn back into the key Biblical theme of a story of two brothers (Cain & Abel, Isaac & Ishmael, Jacob & Esau, etc.). We can see in the two brothers the Pharisees/Scribes vs. Tax Collectors/Sinners with God as the father. This dissection of the Prodigal Son has a wonderful discussion on freedom. The younger brother "seeks radical freedom. He wants to live only for himself, free of any other claims. He enjoys life; he feels that he is completely autonomous...Those who understand freedom as the radically arbitrary license to do just what they want and to have their own way are living a lie for by his very nature man is part of a shared existence and his freedom is shared freedom...(204) This parable really tells the tale of the here and now, as hard as that is to swallow. Chapter eight delves into the Gospel of John very well in introducing the reader to the hermeneutics of Biblical Study: first addressing the historicity of the Gospel and its context, then diving into the five key elements of theological concern of the author, his personal recollections, early church tradition, the historical reality and the guidance of Holy Spirit. Pope Benedict points out that much of the actions and significance revolves around the traditional celebrations and feasts of the Jewish community in Israel including Passover, Pentecost, Tabernacles, Hanukkah and the Day of Atonement. We are introduced to the principal images to watch for in the text like waters in a fresh spring, flowing, and wells, representing baptism, washing, and quenching thirst; or the vine & wine symbolizing feasting and glory, seeing Jesus as the giver of wine, sweetness and joy - that his presence calls for a time of celebration but we are not to forget the necessary sustenance it provides and the pruning it will require; bread and wheat reminding us of God providing manna, envisions the law as bread, remembering the wheat grain dying to produce the bread to sustain us which is clearly Jesus' sacrifice; and finally The Shepherd, seeing Jesus as ruler. protector. provider, guide, gatherer seeking out the lost, the door, the 'good' shepherd, and bringing unity to his flock. The Judges and the Sanhedrin understood who he was, trying to be apolitical in a political world, but we did not and often still do not. We stand there like Pilate, judging but not knowing, with more power than we know to affect a change in the world... I am looking forward to the final installment of this trilogy. Pope Benedict XVI (Latin: Benedictus PP. XVI; Italian: Benedetto XVI; German: Benedikt XVI. ; born Joseph Aloisius Ratzinger on 16 April 1927) was the 265th Pope, by virtue of his office of Bishop of Rome, the Sovereign of the Vatican City State and the head of the Catholic Church. He was elected on 19 April 2005 in a papal conclave, celebrated his Papal Inauguration Mass on 24 April 2005, and too Pope Benedict XVI (Latin: Benedictus PP. XVI; Italian: Benedetto XVI; German: Benedikt XVI. ; born Joseph Aloisius Ratzinger on 16 April 1927) was the 265th Pope, by virtue of his office of Bishop of Rome, the Sovereign of the Vatican City State and the head of the Catholic Church. He was elected on 19 April 2005 in a papal conclave, celebrated his Papal Inauguration Mass on 24 April 2005, and took possession of his cathedral, the Basilica of St. John Lateran, on 7 May 2005. A native of Bavaria, Pope Benedict XVI has both German and Vatican citizenship. On 11 February 2013, Pope Benedict announced his resignation in a speech in Latin before the cardinals, citing a "lack of strength of mind and body" due to his advanced age. His resignation became effective on 28 February 2013. He is the first pope to resign since Pope Gregory XII in 1415, and the first to do so on his own initiative since Pope Celestine V in 1294. As pope emeritus, Benedict retains the style of His Holiness, and the title of Pope, and will continue to dress in the papal colour of white. He is expected to move into the newly renovated Mater Ecclesiae monastery for his retirement. He was succeeded by Pope Francis on 13 March 2013. After a long career as an academic, serving as a professor of theology at various German universities (he formally remains a professor at the University of Regensburg), he was appointed Archbishop of Munich and Freising and cardinal by Pope Paul VI in 1977. In 1981, he settled in Rome when he became Prefect of the Congregation for the Doctrine of the Faith, one of the most important offices of the Roman Curia. At the time of his election as Pope, he was also Dean of the College of Cardinals, and as such the primus inter pares among the cardinals. Like his predecessor Pope John Paul II, Benedict XVI is theologically conservative and his teaching and prolific writings defend traditional Catholic doctrine and values. During his papacy, Benedict XVI has advocated a return to fundamental Christian values to counter the increased secularisation of many developed countries. He views relativism's denial of objective truth, and the denial of moral truths in particular, as the central problem of the 21st century. He teaches the importance of both the Catholic Church and an understanding of God's redemptive love. He has reaffirmed the "importance of prayer in the face of the activism and the growing secularism of many Christians engaged in charitable work." Pope Benedict has also revived a number of traditions including elevating the Tridentine Mass to a more prominent position. Pope Benedict is the founder and patron of the Ratzinger Foundation, a charitable organisation, which makes money from the sale of his books and essays in order to fund scholarships and bursaries for students across the world. “The great question that will be with us throughout this entire book: What did Jesus actually bring, if not world peace, universal prosperity, and a better world? What has he brought?